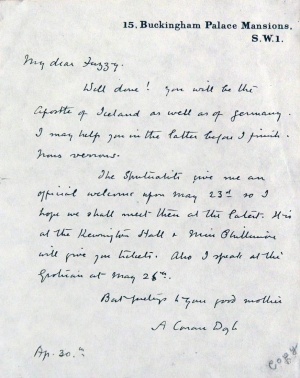 This letter was written by Arthur Conan Doyle on 30 april 1929 from 15 Buckingham Palace Mansions, London, to Florizel Von Reuter that he affectionately called "Fuzzy". The Spiritualists give me an official welcome upon May 23rd so I hope we shall meet then at the latest. It is at the Kensington Hall & Miss Phillimore will give you tickets. Also I speak at the Grotrian at May 26th. ↑ Nous verrons : in French "We will see". This page was last edited on 2 June 2018, at 13:48.